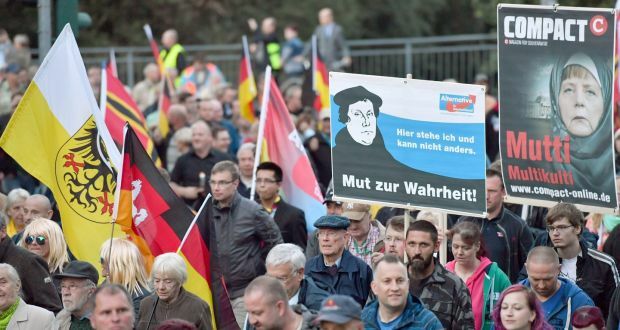 Supporters of right-wing Alternative for Germany (AfD) attend a rally. Germany’s populist party Alternative für Deutschland (AfD) is expected to come third in parliamentary elections on Sunday, an achievement not seen by far-right for some 60 years. The AfD will secure seats in the Bundestag gaining up to 13 percent of votes. Incumbent Chancellor Angela Merkel’s Christian Democratic Union (CDU) is likely to win the election with 34 percent of votes. Social Democratic Party (SPD), lead by Martin Schulz, will take the second place securing 21 percent of votes, according to the polls. The libertarian Free Democratic Party (FDP), The Left and The Greens are also expected to enter the German parliament. Despite the comfortable lead in polls, the CDU and its junior coalition partner the Christian Social Union (CSU) may lose 5 percent of the vote compared to the previous election, according to The Washington Post forecast. The new German government will need to handle relations with the administration of U.S. President Donald J. Trump, address the ambiguity surrounding Brexit talks, find an approach to Turkey and confront the rise of authoritarianism in several E.U. countries, such as Hungary and Poland. Both Ms. Merkel and Mr. Schulz are pro-European Union, and have pledged to end E.U. membership negotiations with Turkey, if political situation there worsens.